Yoshimura is MIA while a teenager is bringing out the YouTube trolls. Welcome to Japan’s Men’s Team selections for the Leibherr 2017 World Table Tennis Championships. Japan’s selections for their Men’s Team at the Leibherr 2017 World Championships range between the obvious and the implausible. So let’s start the ball rolling. First up to the plate, Jun Mizutani. The Fisher King who we all know will have to stay close to the table if he is going to a win a medal; China revised their smashing skills after Michael Maze. He’s a Rio Olympic bronze medallist, but let’s be frank, you only have to deal of two Chinese team members there. He needs his serves to be on point, the right draw. And he needs to find himself a reliable backhand, fast. Then there is the Koki Niwa. He defeated Xu Xin at the Asian Championships, using the Nittaku ball, and the same will be used in Dusseldorf. Rather than complaining about the differences between the plastic balls, it’s more interesting to look at how each manufacturer’s ball is better suited to different playing styles. It’s similar to considering different tennis players on grass, hardcourt and clay. The Nittaku ball is kinder to Niwa. It’s simpler for him to play his high risk counter game and swing big. He will either produce fireworks or go down in flames. Kenta Matsudaira, the one time junior genius claimed his place in the team by winning a national qualification event. He defeated Yuya Oshima for the spot. Both would have been fine selections. But let’s make a blunt assessment; on Matsudaira’s bad days he can lose to anyone in the top 150, on his good days he can hold his own against anyone in the top 5. He is also seemingly an expert at playing against China, geared towards their style, but he struggles with Europe. A lucky draw and he could in with a better chance for a medal than his higher ranked compatriots. Then there is the defender Yuto Muramatsu. Why him? Good question. The selections were made in the end of 2016. Probably too soon. Look at Muramatsu’s 2017 results. A four-nil loss to Abdel-Kader Salifou in Qatar, a four-one loss to Sharath Kamal Ajhanta in India, and four-nil loss against Lim Jonghoon in Korea. It ain’t pretty. You’re also hard pressed to find an instance of him taking a game off a Chinese team member in a men’s event. He’s lucky to win more than six points. So they aren’t entering him to win the title. Is he there to clear the bath for another Japanese player. The wildcard chopper? This makes more sense in a team event, not the biggest singles event in the world. He has thirty days to find some form. Tick tock. Finally. 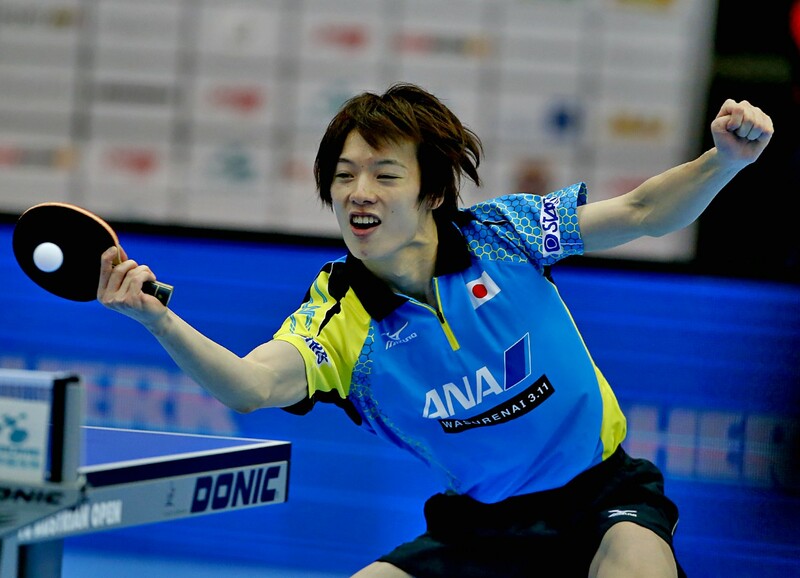 the last place went to Tomokazu Harimoto, the ultimate wild card inclusion in the men’s selection. He divides the audience with his antics. Go checkout the YouTube comment’s section on any of his matches and see the polarising effect this kid has. He’s a top 70 player in the world, but they have so many top 30 it seems like a odd choice. Are they looking to give him experience? Interesting time to do it. But why not if he is a prospect for Tokyo 2020? Yet would Japan really send a 17 year old male to the Olympic Games on home soil? It’s a question worth asking. A culture that is youth obsessed and is this a chance to recreate the marketing potential of Miu and Mima in the boys. The selection is ultimately crazy unthinkable bold. So one last question; where in the world is Maharu Yoshimura? A 4-2 loss to an in form Timo Boll in Korea last week shows he would be a contender if he was there. He even proved in 2016 that he can take games off China. With Harimoto and Muramatsu taking places ahead of him there are a lot of stunned fans in Japan wondering what JTTA is doing. Maybe we should just shrug our shoulders, but a petition and protest sounds more. Rally the troops, we’re taking this all the way to Tokyo! Why do you think the Japanese National Champion wasn’t given a shot in Düsseldorf? Comment below.